Hingham Education Foundation Grant - "Foster Art"
Click on the above link to hear to me talk about Artsonia and some of my hopes for this grant in 30 seconds. Read some of the artist statements that the children are leaving on Artsonia with their art. You might enjoy reading some of the comments left by family and friends. They always make me smile! Listen to Ellie (above) read from a paragraph she wrote in art class to describe her work. The students were so excited to see this! They all want to write and talk about their art. Listen to the words of Henoc, a second grade student. He is usually shy, but really wanted to talk about his art work. This animated character, with computer voice, let Henoc share his words (and his art!). In 30 seconds! See some of the apps I've tried and recommend (and would love to try with my students). These are posted on the Foster Art website - I have had many requests from families for such recommendations. 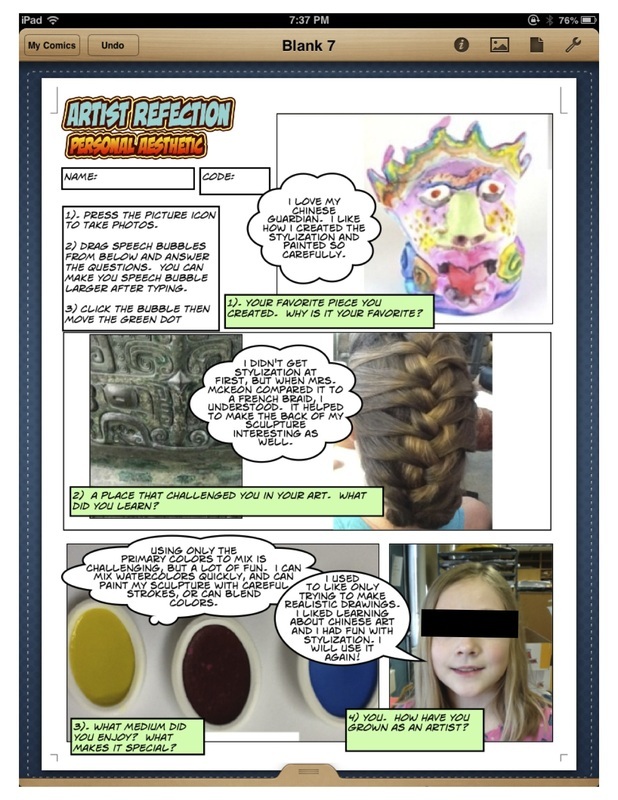 Below is an example of what I would love to have my students actively engaged in - reflection of what they learned, and engagement in expressing it using digital media.